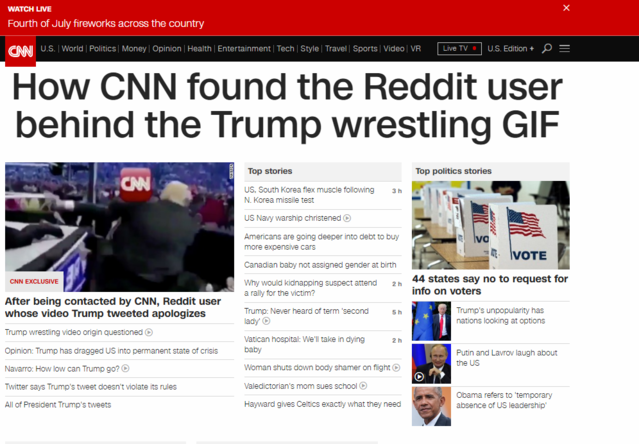 CNN investigated Reddit user "HanA**holeSolo" - the creator of the awesome Donald Trump FNN WWE animated Gif. One day after CNN identified the man behind the account and attempted to make contact with him. Twitter says Trump's tweet doesn't violate its rules?! WTF is Twitter even answering that ludicrous question for? And then CNN blackmailed him! CNN is not publishing "HanA**holeSolo's" name because he is a private citizen who has issued an extensive statement of apology, showed his remorse by saying he has taken down all his offending posts, and because he said he is not going to repeat this ugly behavior on social media again. If you watch CNN...if you read CNN.com...you sir are an ahole. And Twitter? Answering whether or not that Tweet VIOLATED its rules? May be time for Donald to simply create his own social media platform and tell Twitter to GO BLOW.